Essential oils, especially Ocimum basilicum and Eucalyptus globulus oils were among the most important oils that contain active ingredients which have fumigant repellent activity against insects in stores. The Surinam beetle, Oryzaephilus surinamensis, was the store insects that attack dry dates in the store. The use of these oils in the control of this insect is safer for human and animal health. Essential oils of O. basilicum and E. globulus were tested for their volatile toxicity in the laboratory against sawtoothed beetle, O. surinamensis. The concentrations of 4.0, 8.0, 16.0, and 32.0 μl/l air were used in the volatile toxicity experimental. The results indicated that O. basilicum was highly toxic than E. globulus. The results indicated that increased concentration of different oils and exposure time leads to increase in the percentage of mortalities. Also, in storage experimental, the toxic activity for the tested oils was investigated. Ocimum basilicum protects dry dates in storage for 3 months from Surinam beetle infestation. The storage experiment clearly confirmed that O. basilicum and E. globulus could be used in the protection of dry dates from infestation with O. surinamensis. Date palms, Phoenix dactylifera, are among the most important dry fruits of high nutritional value. The economy of many Arab countries depends on the production and export of dry dates (Johnson, 2012). In Egypt, the area harvested was 519,858 ha. (16 million trees) and the production was 1,694,813 tones (FAOSTAT, 2016). In the developing countries, dry dates were attacked by highly many stored insects during storage causing the loss of their quality and quantity (Talukder et al. 2004). It is estimated that more than 20,000 insect species in the field and stores pests were destroyed approximately one-third of the world’s food production that valued annually at more than $100 billion and the highest losses (43%) occur in the developing world (Jacobson, 1982). The quantitative and qualitative damage to stored grains and grain products from the insect pests may amount to 20–30% in the tropical zone and 5–10% in the temperate zone (Talukder, 2006, Rajendran and Sriranjini, 2008). The sawtoothed grain beetle, O. surinamensis, is one of the pests known to attack stored foods and it is cosmopolitan in distribution and is likely to be found in almost any stored food of vegetable origin (Panagiotakopulu and Buckland, 2017). Since the 1950s, synthetic pesticides had been used extensively in grain facilities to control stored product insect pests. Fumigants such as methyl bromide, phosphine, cyanogens, ethyl formate, or sulfuryl fluoride rapidly kill all life stages of stored-product insects in the storage. Fumigation was still one of the most effective methods for the prevention of stored product losses from insect pests but insect resistance had been developed (Rajendran and Sriranjini, 2008). The use of phosphine as fumigation in storage is inefficient (Leelaja et al. 2007). The use of methyl bromide has recently been prevented because it is proven to be a cause of the ozone hole (WMO, 1995) and has been banned in developed countries, and developing nations have committed to reduce its use by 20% in 2005 and phase out in 2015. 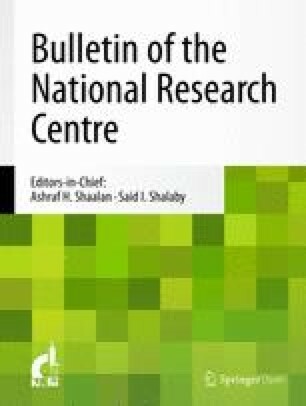 During recent years, some plants have been receiving global attention, and their secondary metabolites have been formulated as botanical pesticides for plant protection since they do not leave residues toxic to the environment and have lower toxicity to mammals and medicinal properties for humans (Athanassiou et al. 2017). Recently, natural pest control methods including essential oils have been increasingly explored (Batish et al. 2008). Essential oils exhibit a wide spectrum of biological activity including antimicrobial, fungicidal, insecticidal, insect repellent, herbicidal, acaricidal, and nematicidal properties (Nenaah, 2014). Previous studies reported that the fumigant toxicity of some oils was highly effective against different stages of many stored insects (Jouda et al. 2012 and Jouda et al. 2013). The use of volatile oils at high concentrations and tight storage led to the protection of the stored product for long periods of up to 2 months and more (Rajashekar, 2016). The effectiveness of volatile oils against stored grain insect pests was depended on the volume of the storage grains, space of the store, and concentration of essential oils (Hernandez-Lambrano et al. 2015). The objective of the present research was to evaluate fumigant toxicity and efficacy of the tested oils in protecting the storage dry dates from the Surinam beetle infestation. Fifty-kilogram sample of dry dates, Shamyia variety, were collected from special stores located in Cairo City in 2017 season. The collected samples of dry dates were transferred to the laboratory and then inspected to identify different species. Surinam beetle adults were representing approximately 75% of the different species found in the collected samples. Five hundred adults unsexed Surinam beetles collected from these samples were released to be confined with 10 kg disinfected dry dates in wood cages (60 cm × 60 cm diameters). The culture was maintained in the dark storage at 27.0 ± 3.0 °C and 70.0 ± 5.0% R.H. All experiments were carried out under the same environmental conditions. Two essential oils of Ocimum basilicum (Basil) and Eucalyptus globulus (Eucalyptus) were provided by T. Stanes and Company Ltd. India. The fumigant bioassays were conducted as described by Dimetry and Abd El-Salam (2010) with some modifications. Different concentrations, 4.0, 8.0, 16.0, and 32.0 μl, were prepared from the tested oils. Exposure periods of 24.0, 48.0, and 72.0 h were made to evaluate the fumigant toxicity against the target insect adults. Filter paper stripes (4 × 5 cm, Whatman N° 1) was treated with the different recommended concentrations and then the treated filter paper was attached to the screw caps of glass jars (1 l in valium) and one dry date fruit with wire was hanged under the filter paper. Twenty insect adults were placed at the bottom of the glass jar. Caps of glass jars were screwed tightly. The jars were kept under laboratory conditions (27.0 ± 3.0 C and 70.0 ± 5.0%R.H). The mortality of mortality was determined after 24.0, 48.0, and 72.0 h from the beginning of exposure and then it was recorded hourly. Abbott correction formula (Abbott, 1925) was applied to assess insect mortality. Each experiment was replicated five times for each concentration. The control samples were maintained under the same experimental conditions. Probit analysis (Finney, 1971) was used to estimate LC50 and LT50 values. Whereas NIF = number of infested dry dates and NUF = number of uninfected dry dates. Five replicates/treatment/concentration were used. The control gunny sacks were maintained under the same conditions without any essential oil. All the results were statistically analyzed using one-way analysis of variance (ANOVA), and the means were compared using the least significant difference test (LSD, P ≤ 0.05) (computer program SPSS version 11.1, 2011). All the treatments with the tested essential oils showed a significant level of volatile toxicity to the Surinam beetle. The recorded results indicated that the percentage mortality increased with the increase of oil concentrations and exposure period Table 1. Probit analysis showed that O. basilicum was achieved LC50 = 35.6, 11.45, and 4.9 μl/l air at 24-, 48-, and 72-h exposure periods, respectively. E. globulus was less effective (LC50 = 101.23, 75.6, and 62.5 μl/l air at 24-, 48-, and 72-h exposure periods, respectively.) Table 1. The results obtained in Table 2 indicated that increasing of the tested oil concentrations achieved the highest percentage mortality at the low-exposure period. O. basilicum oil (Basil) revealed high toxicity at concentrations of 4.0, 8.0, 16.0, and 32.0 μl achieved 50% mortality at 76.4, 57.4, 41.06, and 25.02 h, respectively. While Eucalyptus globulus oil alone was less efficient to achieve 50% mortality after 360.8, 226.5, 195.4, and 143.3 h exposure period. The results in Table 3 clearly confirmed that the lowest concentrations of the tested oils of Eucalyptus globulus (10.0, 20.0, and 40.0 ml) were not effective in protecting the storage dry dates. While O. basilicum oil at a concentration of 80.0 ml/625 cm achieved full protection for 2 months, adult insects were found among dry dates (8.6 and 15.4 adult insects after the third and the fourth months, respectively.). Basil (O. basilicum oil) followed by E. globulus were efficient in protecting the storage dry dates. The treated sacks with basil oil at a concentration of 40.0 ml gave full protection from adult infestation for 1 month after that the adults’ infestation started to appear in 6.0, 18.4, and 45.2 adults after the second, third, and fourth months, respectively. The percentage of qualitative losses during these periods was 0.0, 11.33, 14.88, and 36.11% from the first till the fourth months. The results clearly indicated that Basil oil was more toxic than E. globulus. The treated sacks with Eucalyptus globulus oil were the lowest effective in protecting the storage dry dates. At a concentration of 80.0 ml, the adult’s infestation recorded 32.2, 52.6, 92.8, and 197.2 during the first, second, third, and fourth storage months, respectively. The percentage of qualitative losses reached 10.88, 34.0, 44.44, and 68.66%. In comparison with the control storage dry dates, after the first month, the adult infestation reached 248.8 adults, and the percentage of qualitative loss was 52.44%. After the second, third, and fourth month, the adult infestation rates reached 278.4, 433.2, and 694.0 adults, and it caused 87.1, 96.44, and 98.44% qualitative loss in the storage dry dates. The data recorded agree with Abd El-Salam, (2010) after treatment with some oils such as tea tree, cinnamon, lemongrass, and thyme against Callosobruchus maculatus L. and Sitophilus oryzae L. adults for its fumigant activity. Results showed that both tested oils gave acceptable mortalities after 10 days of exposure. The influence of temperature and exposure period on the efficacy of the fumigant toxicity of plant products has been investigated. Lee et al. (2003) tested the monoterpenoids (cineole, fenchone, perillaldehyde, and pulegone) against T. castaneum adults for 24–96 h at 24 and 37 °C. They found that the higher temperature caused higher mortalities. Lopez et al. (2008) reported that toxic fumigant of coriander (Coriandrum sativum), caraway (Carum carvi), and basil (Ocimum basilicum) essential oils were attributed to Estragole as active ingredient against insect pests. The toxicity of a large number of essential oils such as O. basilicum and E. globulus indicated insecticidal activity (contact toxicity, repellency, growth inhibition effect, ovicidal) their constituents have been evaluated against a number of stored product insects (Tunc et al. 2000). Previous studies have confirmed that plants have defensive materials that secrete them to keep themselves from insect attacks such as secondary plant substances. These substances have a toxic effect on insects where the nervous system affects the insect through the effect on the inhibition of the enzyme acetylcholinesterase, causing complete paralysis of the insect (Isman and Machial, 2006; Kim et al. 2013; Hernandez-Lambrano et al. 2015). Also, it may affect different targets including γ-aminobutyric acid (GABA)-gated chloride channels, octopamine receptors, tyramine receptors, acetylcholine esterase, nicotinic acetylcholine receptors (nAChR), sodium channels, and possibly other targets (Tong and Coats, 2010). Shaaya et al. (1991) indicated that sage, bay laurel, rosemary, and lavender oils were more toxic to R. dominica, while oregano, basil, and thyme oils were toxic to O. surinamensis (L.). Ogendo et al. (2008) showed that fumigant toxicity and repellency of O. gratissimum oil and its constituents were significantly influenced by concentration and time after treatment. At 1 ml/l air, the oil caused high mortality of R. dominica, O. surinamensis, and C. chinensis, respectively, day after treatment, whereas eugenol achieved 79.0, 61.0, and 100% kills of the same insects. b-(Z)-ocimene produced a weaker toxicity with R. dominica and O. surinamensis and medium with C. chinensis. Tampieri et al. (2003) investigated Eucalyptus globulus oil using GC and GC–MS techniques and found that the high compositions were 1.8 cineole (81.4%) and limonene (7.0%). While the high compositions in Ocimum basilicum oil were estragol and linalool 74.5 and 20.3%, respectively. These active ingredients may have an effect in prolonging the storage period. Essential oils and their constituents of different Eucalyptus species (Myrtaceae) and Ocimum species (Lamiaceae) show many insecticidal activities against stored-grain insect pests (Keita et al. 2001; Jirovetz et al. 2005; Ngassoum et al. 2007). The main component present in essential oils of Eucalyptus species are 1–8 cineole and in Ocimum basilicum are eugenol which showed different insecticidal properties against insect pests (Mishra et al. 2012). The packaging of products was the optimal style for protecting against insect infestation. Newton, (1988) stated that the insects attack packaged products. Highland, (1991); Cetin et al. (2004) reported that packaging materials can be improved and coat the outer package surface by volatile oils from different plant species. Some volatile oils have properties as ovicidal, larvicidal, and repellent. These applications lead to grains protection. The results clearly indicated that the use of the oils at high concentrations achieved good and highly mortality percentage within short exposure time. This has been reported for many aromatic oils against some stored insects (Mondal and Khalequzzaman, 2010). Furthermore, the persistence of insecticidal activity in the oils was attributed to its content of active ingredients. Coating of the outer package surface with botanical oils was lead to good protection against the stored product insects. Aromatic oils could be playing an important role in stored dry date protection from insect infestation. The sawtoothed grain beetle (larval and adult stages) attacks all foods of vegetable origin, such as date fruits. The relationship between increased oil concentration and death ratio is a positive relationship. Because sawtoothed beetle is very dangerous to date fruits in stores, coating of the outer package surface with botanical oils lead to fine protection against the insect infestation. Furthermore, the insecticidal activity of the aromatic oils was attributed to their active ingredients (Ilboudo et al. 2010). It is important to remove infested fruits after harvesting time directly to keep other fruits from the source of the next infestation. Dry fruits had more defenses to sawtoothed beetle than semi-dry date. The use of gunny sacks for date fruits storage with surface coated oils is better than fumigant applications. It is a pleasure to acknowledge Pests & Plant Protection which follows National Research Centre, for their supporting to carry out this research. AESAME designed the experiments, wrote the manuscript, analyzed the data, and also published it. SSA designed and performed the experiments, and reviewed the manuscript. ARRS designed and performed the experiments, and collected the data, All authors read and approved the final version.